The rapid just above the put-in is commonly portaged by folks when the water is up, several large holes are present to give you a ride so look at it before you decide to hike up to the top of it to run it. 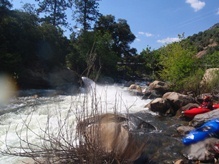 At lower flows, the pictures I have seen make the rapid look much friendlier. However, if the water were lower, I think this run would get really manky. As it were, I thought it was a big on the manky side. 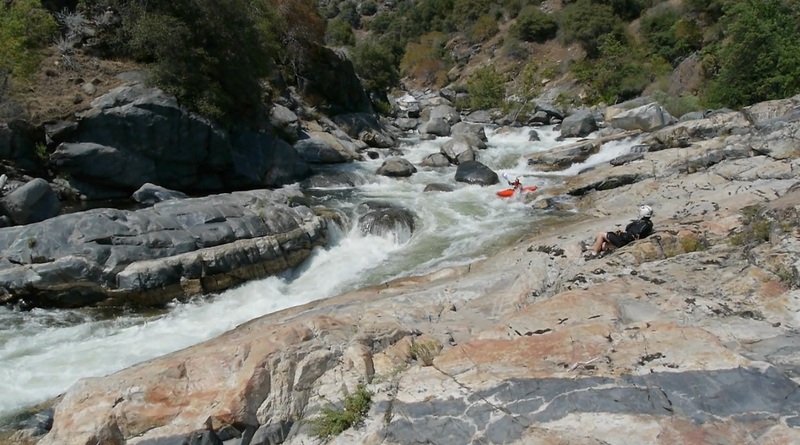 The rapids are all boulder gardens in a wide creek bed with only one exception of bedrock . It is because of this I think if you caught it with some juice, that it would be a fun class IV+ continuous boulder garden affair (let me know if someone finds out otherwise). 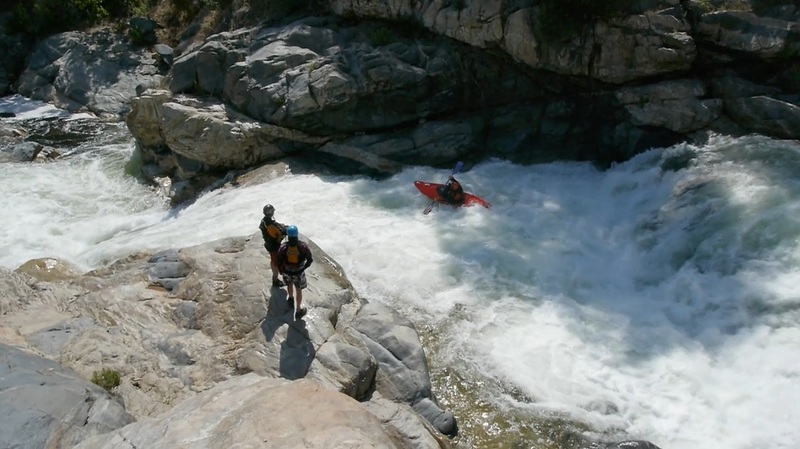 American Whitewater has some good pics of this run here. "...You wondered why the lowest short section of Dinkey was included in any guides since it was only the last and junkiest 1.5 miles of the waterfalls section. I feel a need to defend this little section. It was included as a separate section for both historical and pragmatic reasons. This was the very first section of Dinkey to be boated, I think in 1985. For a year or two this was the only section of Dinkey that got boated. So there is some minor historical significance at least for local boaters. The pragmatic reason is that this section is accessible year round and can be boated at higher levels than the upper reaches. So it was fairly common for us to boat this section & the NF Kings after a good rain during the winter. 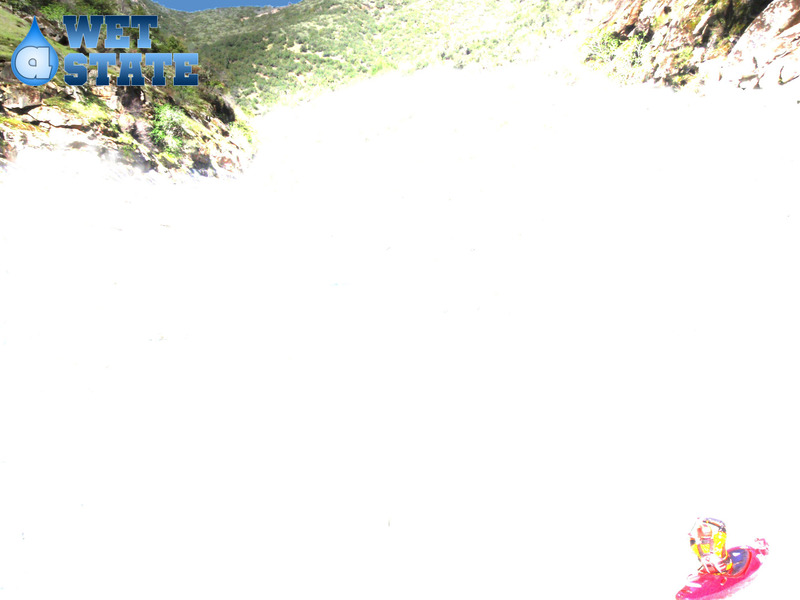 This section is pretty stomping with 700 or 800 cfs. I boated a bit of it around 2,000 once, but that was nuts for me. Boats and boaters are a lot better these days so I think the upper limit might creep upwards. Last Rapid (V). This rapid is occasionally portaged as there are 4 large holes, each one getting progressively bigger. Tiny Chute (IV to IV+). The one bed rock drop of the run. There is the hero line in the center that should only be run at flows of ~450 or below. It is a 6 foot boof to downtime. Then roll up and paddle away. The far left line offers a friendly and easier alternative as it is a small slide to boof. Junk City (IV+). The mankiest rapid of the run. We started far left and worked back right. There were some sieves in here, I would recommend scouting this one for sure. Though I am not sure where would be best. Sieve (IV to IV+). Be aware, there is one rapid about half way through that you enter on the right and then move left. The right side of the rapid is a wall of sieves, so be in control or use the eddy just in front of them on the right. Flume (IV-P). 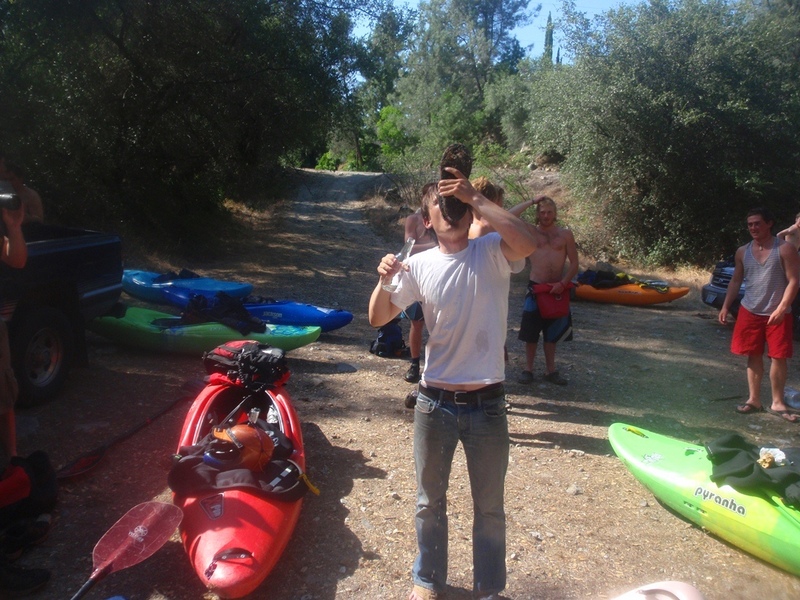 Once you pass under a water tube, be ready to make a quick portage around a high pressure jet of water coming out of a turbine from the right. Easy walk on the right. Some people run the rapid far right ducking the jet. That is a good way to lose your head. Literally. Take-out: From Fresno, take Highway 180 East towards King Canyon. Take it through town eventually heading north one block on either Del Rey Ave or North Academy Ave (after 13.5 miles) and turn right on East Belmont. After 6 miles this changes names to Trimmer Springs rd. 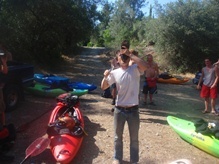 Follow Trimmer springs around the lake until it begins going up the Kings River itself. Cross the river and go left 3.2 miles up to Balch Camp. Put-in: Put-in: Continue driving up Dinkey Creek from Balch Camp. In 1.5 miles the road will turn sharply away from the river. There is a large turn out here. Apparently an old rut road leads down away from this turnout and leads to a clearing with old machinery. From there, follow the trail dropping down to the river.